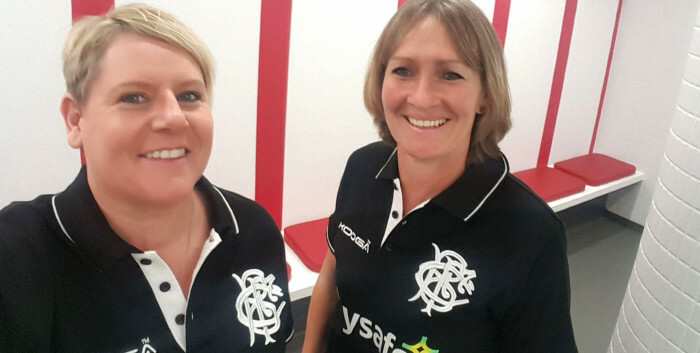 We spoke to Fiona Stockley (pictured below left with Giselle Mather) the woman behind the birth of the first ever women's Barbarians side about what motivates her, what she loves about volunteering in the women's game and what's next for one of the world's oldest clubs ahead of their first games against international sides this summer. Firstly how did you come to get involved initially in the Nomads? I had been involved with squad management for England for a few years and an opportunity came up to manage the Nomads. Prior to this my only involvement with the Nomads had been to play against them with England A prior to a European tournament in 2001. They had been running for a decade, I believe set up by Carol Isherwood in her time with the RFUW in 1994 as a fixture to support England preparing for the Five Nations and give England A players strong opposition. The quality and availability of internationals in the UK was always enhanced by the overseas players who had decided to spend a year or two working in the UK after a World Cup and there was always an excellent calibre of players available and in need of a game in that 5 Nations window as club games took a back seat for the February/March window. How hard was it to get players released to play for you? Levels of professionalism were certainly different in 2006/7 and the availability of players was much more about who England wanted to trial and that made it relatively easy to select a squad. Social media made contacting players easier when the rugby community signed up en masse in to Facebook and that became the new way to communicate with distant friends across the globe. After that the nationalities of players became more diverse and networking for the chance to play against England A and then Wales became the draw for many overseas or recently retired Home Nations players. There were several times where players who were on the fringes of National teams played for the Nomads and then became full Internationals as a result of playing for Nomads. This was certainly a factor for Edel McMahon of Ireland who was the first uncapped Barbarian in the inaugural squad against Munster, who later featured in the 6 Nations squad and gained her first cap for Ireland in the backrow. Was the hard work it for the experiences? The bringing together of rugby friends and adversaries on the pitch made the Nomads a squad that played hard on the pitch and hard in bar! However the Nomads took a more planned approach when South Africa invited us to Johannesburg and Cape Town to play the national side during “Women’s Month” and as part of Nelson Mandela’s 90th Birthday celebrations in 2008. The SA union had been given funding to ensure sport formed part of this series of events. The opportunity had been offered to Scotland initially but their calendar was already agreed and was generously offered to the Nomads. This included flights and hotels for a squad and staff of 30. This was the very first time that funding had been offered to the squad for a tour, as prior to this the Nomads always paid for their own travel to fixtures and contributed to the cost of cleaning the kit and buying tape. Although at this point, I must thank the RFUW who supported the Nomads by covering medical tape costs and shirts for the matches prior to the SA tour. A squad of players was formed for a 10 day 2-test tour in what felt like a heartbeat! Many involved will fondly still call it the “Best Tour Ever”. This was a tour which included Anna Richards, Shelley Rae, Sue Day, Susie Appleby, Leslie Cripps and many other experienced and well decorated players. There were many highlights on this trip including off field experiences such as dining with the SA Sports minister to discuss the development of women’s sport in the UK, to the arrival in Cape Town where we visited the iconic Table Mountain and Robben Island. The rugby was just as much a part of the “pinch yourself” experience in 2008 where the team played a curtain raiser game against the Women’s Springboks before the Men’s Tri Nation’s preparation against Argentina followed by a second curtain raiser game in Cape Town prior the Men taking on the All Blacks. We also played Western Province in a mid week test match. Until November 2017 this was probably a memory I thought would be hard to beat in my time playing, coaching or managing rugby since I first started playing in 1994. How did the Barbarians conversation come about? The very first time I recall thinking that there was the potential to have a women’s Barbarians side was linked to the Nomads tour against SA, where the pre tour press released from South Africa referred to the Nomads as a “Barbarians side” which caught the eye of Gordon Brown the Chairman and committee members of the Barbarians club who called me to ask us not to refer to the side using their club name. I was of course terrified to have received the call knowing the history and worldwide presence of the Barbarians and obliged to his request! I remember putting down the phone distinctly thinking - wouldn’t it be amazing if there was a women’s Barbarian team? Roll on eight years and the opportunity to discuss the potential of a women’s team in the club began with a chance discussion at a Gloucester game with Mike Burton, a previous England, Lion and Barbarian with Abi Chamberlain who I will give full credit for introducing me to Mike. Our discussion lasted for just over two years to the point where the committee agreed to the inaugural Women’s Barbarians fixture and financial support to create squads for two to three fixtures each season. Gordon Brown was still the secretary then and the others included people like John Spencer (chairman), Chris Maidment (who was the treasurer and is now the secretary) and some former internationals like Derek Quinnell, Shane Jennings and Rory Lawson. This was not all that was agreed, for instead of setting up a new women’s version of the club, the Barbarians openly invited the women to join the continuing roll of honour in the club which was set up in 1890, for we would be “One Club”. Their actions in supporting, funding and promoting the women’s fixtures has been nothing short of spectacular and totally inclusive. I am the Women’s Co-ordinator for the club and I work with the committee to arrange fixtures and manage the selection of the squad in conjunction with the coaches. What support are you getting from the organisation? I receive phenomenal and unwavering support from the club committee, which involves their support on behalf of the club, funding, a joint kit deal with our new partners Gilbert and communications and PR management. It has been a very supportive environment from one of the oldest clubs in the world, who work in a very inclusive way. The Club is also keen to support the development and equality in the women’s game and has recently supported the Women’s Sports Trust with a donation which I know will positively impact on the work they are able to do. Is it easier now it’s officially the Barbarians to get players interested? The launch of the women’s team as part of the club was the biggest piece of social media news the club had ever released with the story being picked up globally and viewed on social media in abundance. The launch video was watched 800K times in the first few days and the positive support from players and leaders in the game was unprecedented. Every time we make announcement, or there is a men’s match taking place, my phone is white hot, and players get in touch from across the globe. That is a great sign that the Barbarians is very much the pinnacle of rugby for those who play the game with flair and skill. Going back to social media – it’s so much easier to be able to contact players that you want to be in your squads and live streaming of matches makes the opportunity to watch players is so much easier. This was Lenaig Corson who had an outstanding game against England in the RWC semi-final and had caught the eye of Giselle Mather. We requested the opportunity to invite Lenaig to play for the Barbarians via the FFR who responded very positively and were very happy to release her to play and understood the honour of representing a side that has seen many a French man displaying Gallic flair in the past. What have the experiences been like so far? Similarly to the Nomads V SA test series in 2008, the whirlwind that surrounded the announcement of the women’s Barbarians and the inaugural match at Thomond Park was incredibly special. If felt like a huge step forward in the game for the linking of men’s and women’s teams as well as a recognition of the work and matches I had been involved within the past. When I had the honour of reading out the first starting line-up for the women’s Barbarians in front of both the men’s and women’s squads and in the company of the committee and coaching staff (Robbie Deans, Giselle Mather and Liza Burgess) was the point at which I recognised that it was finally going to happen. All of the calls the emails and the patience over the last two years was presenting itself in the exclusive environment of the Barbarians – the women had arrived centre stage! Having the pleasure of contacting people and inviting them to play is genuinely gives me so much satisfaction and giving people these opportunities is all the drive I have needed to volunteer within the women’s game for the last 25 years. Players are always very grateful for the opportunities and those who were involved in the first game are always keen to offer their availability for future games - that’s when you know the opportunity is as special as I and the committee know it is. Watching a new team grow into a cohesive squad, where they form new and lifelong friendships is rewarding and then seeing them perform on the pitch as a result of their investment in the team culture and game plan is incredibly satisfying. How much of an impact will the England game have? This is probably the biggest game the club could ever play. Their standing as number two in the world, their professional contracts and that the game is taking place at the home of English rugby cannot fail in having a huge impact on the increase of awareness of the sport. What sort of squad are you pulling together? We will need to match the youth, quality and skill of England with the knowledge and guile of current and recently retired Internationals from across the globe. The best available players in the world will be in the frame for an invite to this very special fixture for a unique club. Any other games in the pipeline? Yes. It looks like we’ll be playing three international sides this season. First is the game in Glendale, Denver against the USA followed by England at Twickenham. It’s likely we’ll play a third international side at the end of the year and we should have more news about that before the end of the season. What’s the long term aim? Where we currently sit with two to three fixtures a year in alignment with the men’s would be the first step and linking our fixture calendars may take a year to 18 months to work through, but this will be the plan. The other aim would be to support the work taking place globally to increase awareness of the women’s game and equality of opportunity through the platform that the most special club in the world can provide with its continuing presence in the modern game. "Having the pleasure of contacting people and inviting them to play is genuinely gives me so much satisfaction and giving people these opportunities is all the drive I have needed to volunteer within the women’s game for the last 25 years."